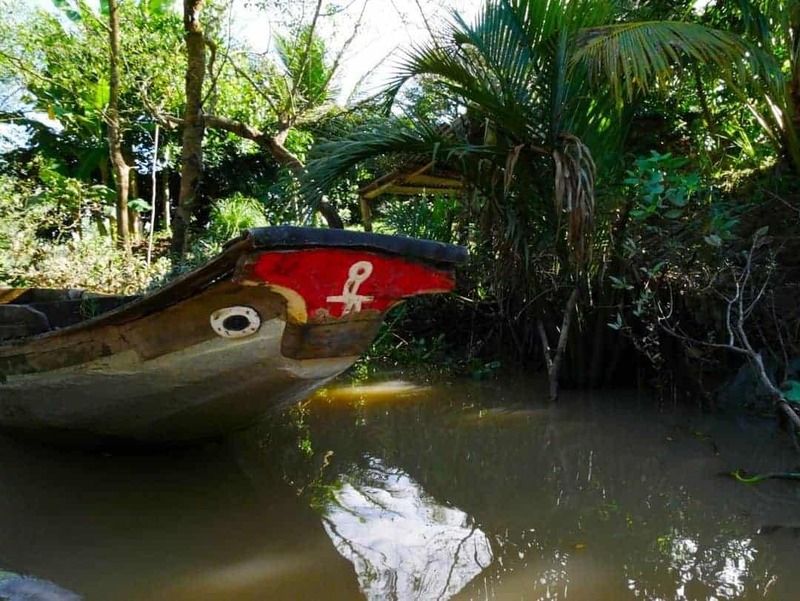 Taking one of the tours through the Mekong Delta is a must do when in Vietnam. “It’s opener, out there, in the wide,open air” – Dr Seuss, Oh the Places You’ll Go! The quote above really sums up our time in the Vietnamese Mekong Delta. With nothing but the river behind and in front, and the breeze in your face, the openness of the river invites you, if only for a while, to absorb the beauty and originality of life on the river. A place, literally and metaphorically, that is worlds away from my own. Where simplicity is as complex as it gets, and the people exhibit true friendliness, as though they have never been impacted by the business and anonymity that we have grown used to in the larger cities. Where motorbikes, bicycles and sampans are the main source of transportation for locals, and small change will get you across to the other side of the river. Gradually, the people of the Mekong are building different lives. Many now have televisions and of course smartphones are everywhere. Still, the traditions remain in much of the Mekong. Change is in the air. Younger generations are now looking towards a different future. and for some, it will mean leaving their place on the river. Fascinated by growing technology, and with a yearning to learn different skills to those of their parents, and those before them, they are seeking opportunities outside the Delta. Some ancient businesses and ways of life are under pressure, whilst others are thriving. Change won’t come quickly here, but like the ebbing and flowing of the river, the change will make its mark here, gently over time. It was an incredible experience to be part of all of this, if only for a short time. No image gallery of the Mekong would be complete without showcasing the river houses. Simple, sometimes barely holding themselves together, they are exposed to the elements here. Whatever Mother Nature throws at them they have to overcome. Sometimes they can’t. According to our Vietnamese guide on the Dragon Eyes boat, the increasing use of the road network has lessened the importance of the river as a transportation route. Whilst still very important, and highly utilised, this change to the river has had a downstream (pardon the pun) impact on the value of river housing. Once highly valued, many are now deteriorating and there is a lack of money and sometimes desire to repair them. 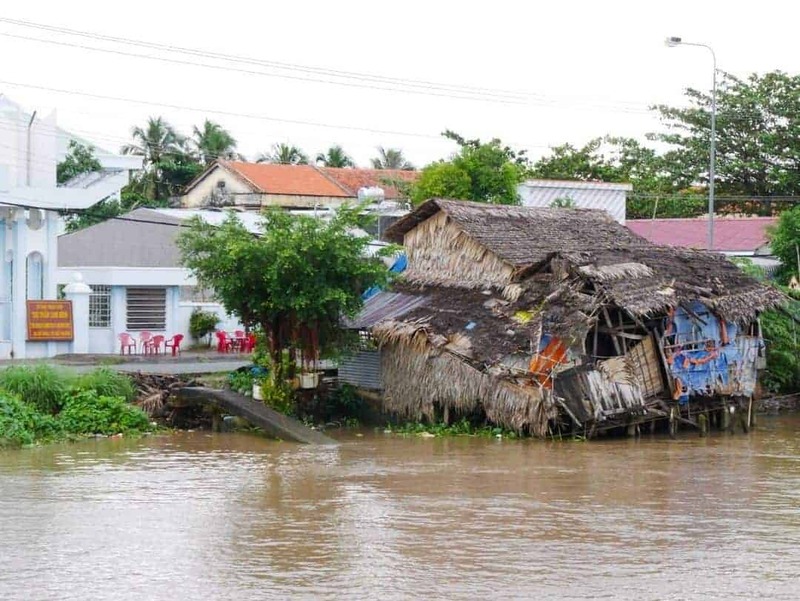 Built directly on the river, these houses are at the mercy of the Mekong River tides. Just about everything that happens in the Mekong happens on the river. 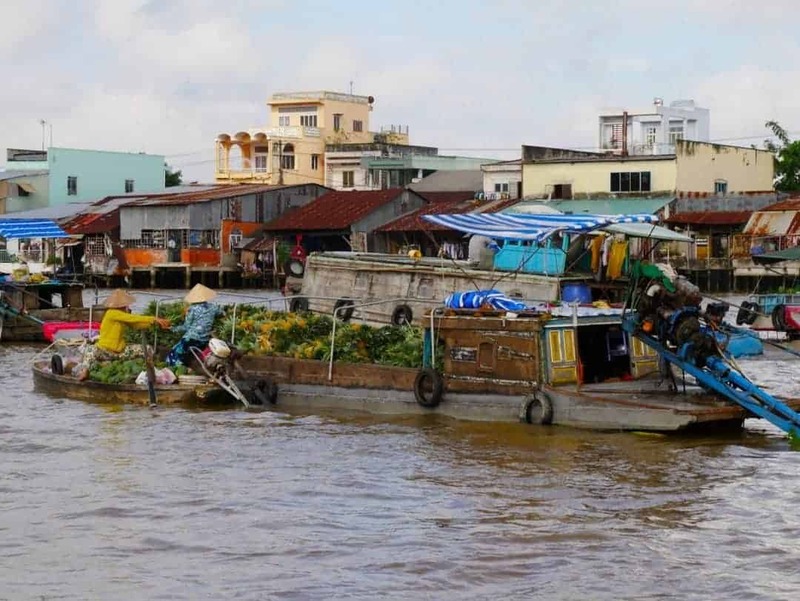 It’s one of the reasons why it is such a great idea to take tours through the Mekong Delta on a boat. Spending time on the river offers a different perspective and to gain a greater understanding of how it works. This man was doing his washing aboard one of the heavy barges that transport materials such as gravel and sand up the river. With limited resources on board, the washing is done in a small bucket. For those who work on the boats, they are both a place of work and rest. Whilst many of the boats will have bunks in the lower levels, many of the people sleep out in the open. I even noticed this on our own boat. With five crew on board, they all share a sleeping cabin. Early one morning when I went up onto the upper deck to take sunrise photos, one of the deckhands had actually been sleeping on the sun lounges. The poor thing got a fright as I don’t think he was expecting to see anyone quite so early. Many of the boats have very small cabins for the captain to operate from. 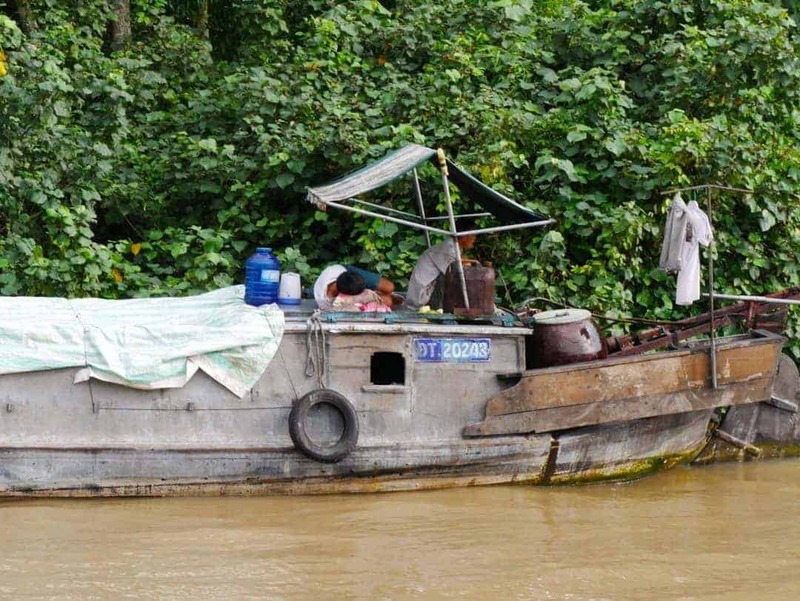 The Vietnamese people are used to squatting, but I will admit to being a little surprised when I saw them driving the boat in this position, sometimes even steering with their feet. Similar to the weird and wonderful things you see on the back of motorbikes in Vietnam, almost anything goes with boat transportation. These ferries, carrying passengers and their motorbikes scoot back and forth across the river all day. All boats in Vietnam (except the sampans) have eyes! There are many myths surrounding these eyes but the most common relate to the good spirits bringing the boats back to shore safely, and also to ward off bad spirits in general. The fronts of boats will be painted red, black or blue, depending on their purpose. The floating markets were one of the highlights along the river and we were lucky enough to see two. The best part is that they are still the authentic trading markets they have always been without a tourist souvenir in sight. Wherever we went, we were usually followed by a group of children. The kids on the bikes rode around after us in one of the small villages. Similarly, when we were on the water, sometimes passing other boats quite closely, we were always ready with a wave. I was always on the lookout around the houses as usually a child would appear from somewhere to call out and wave. As we were touring through a local school, we stopped at the shop to meet the owner. Before long, she had thrust her baby onto my husband ! These kids were hilarious. I was actually doing a cooking class at the time when they grabbed my attention. These guys wanted to dance and they all thought it was funny when I made up my own moves to mirror theirs ! Not only does the work happen on the river, but it’s also busy behind the scenes, often in small and very hot buildings. The Mekong Delta is full of great contrast and a beauty that can only truly be understood and appreciated by visiting here. If you’ve not been, then I hope my stories and these images provide you with inspiration. Who knows, perhaps one day you might just get to see it for yourself. 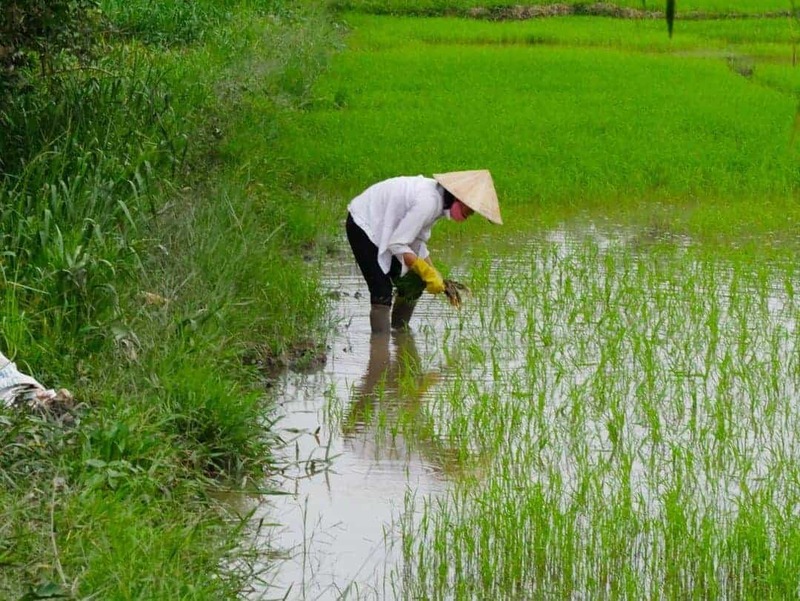 There are some excellent tours through the Mekong Delta to tempt you. 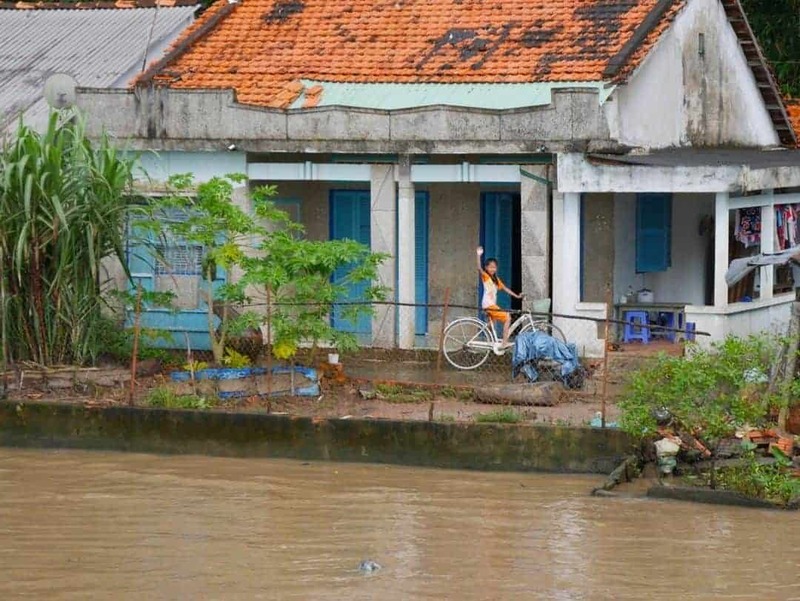 Looking to stay in Can Tho ahead of your Mekong Delta trip? Hotelscombined.com has plenty of options for this area. The thing striking me is how friendly the Vietnamese are. From your stories, to the images, to the 3 months we spent in Vietnam in 2012, goodness gracious folks were always waving and smiling and greeting and being warm and hugging and shaking our hands. In South Vietnam, when people asked us where we were from and we told them USA, folks would smile, shake our hands or hug us, then break out their war stories. Many former farmers were chopper pilots or at least fought from the choppers with US troops, and told us about fighting with American soldiers, different battles. Amazing experience. Everybody was just so freaking friendly for the sake of being nice, warm and inviting. Blessed people who showed us love like few people around the globe. Love that image of the lady pushing her baby onto your husband LOL! Classic Vietnamese activity here as it’s almost like you’re in the fam when you meet many of these warm folks. What a fantastic post Kerri. Thanks for sharing. Thanks Ryanb, once again I also learn from your stories also. I think Vietnam will have many more of these great stories for decades to come. Wow,both the houses and boats look like they’re falling apart! But the scenery is gorgeous and the kids are so cute. I’d love to visit one day! That’s all part of the life ! It’s a great place and a wonderful place to be thankful for what you have. What amazing pictures! They took me right back to Vietnam when I visited the Mekong Delta in 2013. I love especially the pics showing the life of the people on the boats, that´s what fascinated me most when I was there , so thank you for sharing! You will have known exactly what I was talking about ! Great photos! What camera do you use? I love going through photo diaries like this as it gives you a glimpse on the everyday life of others! Thanks Anna, I use a Panasonic Lumix G7. I can’t believe they would ever end up with clean clothes the colour of that river! It’s a much tougher life than I would like but I’ve never had to make do in these conditions. They are tough, resilient people. We’ll be in Vietnam in a couple of months, but hadn’t considered doing the Mekong delta, it looks amazing. Where did you start your tour from? You can check out my article on the Dragon Eyes which gives all the details, but we effectively started in Saigon, got a transfer down to Can Tho and then back again. Mekog river is one of the mightiest rivers of the World. I enjoyed reading your story about people’s lives next to Mekong. While reading it, in my imagination I have even heard sounds of smiling children waving to the passengers … so beautiful ! You probably did as they were very loud calling out to us. Beautiful photos Kerri! You really captured life on the Mekong. 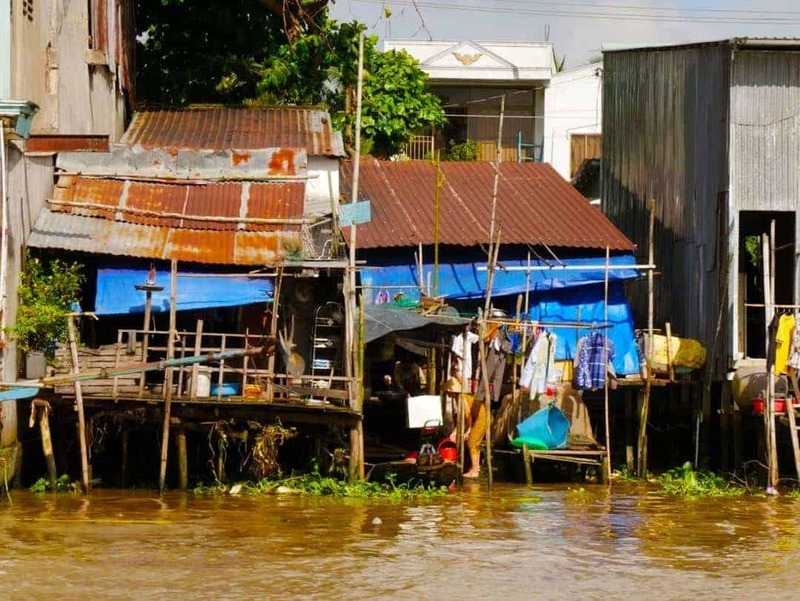 I was always amazed by the ramshackle houses on stilts over the water – they look like they could collapse at any moment! And I worry about their knees – all that squatting for food prep etc must be doing some damage. But I suppose that’s how they have lived and worked for centuries and they are built for it. I remember I tried it when we were in Vietnam (and we often forced with the low chairs at street food stalls) and I can’t say it was the most comfortable thing for a westerner! It’s definitely not natural is it. They do it everywhere….and so easily. Even I remember in Indonesia they squat out the front of their houses. Thanks so much for all of your wonderful comments Vicki. I’d love to take a boat ride through Mekong Delta. It’s so cool all the boats have eyes; it really brings them to life! The floating markets also look really interesting to explore. Putting this on my bucket list! It truly is a wonderful place. So much to see and learn. WOW how long were you on the river for? I did a day trip to the markets and it was AWESOME! „e had lunch on a floating restaurant and ended up doing shots of something (who knows) with the owner and his sons. So crazy! three days – was awesome to be able to spend this long here. Yes I’ve not quite seen anything like this. Your photos are amazing! This is possibly the only thing we’re gutted about not doing when we visited Vietnam. It must have been a great experience, it sure does look like it was anyway! At least we’ve got something to go back for though! Thanks Paul. It’s always great to have something to go back to a place for. Very detailed post with a lot of self-explanatory photos is all the readers want. And that what’s you have provided. I loved the eyes part, we need someone watching over us all the time and bring us to our destination safely. Really enjoyed reading. Thanks Vishal, really appreciate that. The simplicity and the modest lifestyle is so endearing and relaxing at the same time. The people look so friendly and so satisfied with their way of life. This makes me so happy! The pictures bring alive the simple yet beautiful life of the people. The Mekong feels like such a totally different world, and to get such a close up insight is a priveledge. Your photos are just incredible. The boats having eyes is an interesting little fact! I think spending quality time here and not just a night really helps uncover a lot more. What a fascinating look at this often-overlooked area! I love photo essays, especially when they are of daily life in an area, so this post really grabbed me! Thanks for all of the information. It seems like such a unique place to visit! I would be so scared to be in one of the houses though, they really are at the mercy of the river tides! I liked the pictures you took of the locals as it is something I try to do also when I travel, sometimes faces tell a bigger story than architecture. Yes many of the houses are just hanging in there. Wow, this looks like a place with an immense amount of character and the picture you have taken sure do a good job at expressing this! Hey Jarrod, all done with a Panasonic Lumix G7. What I love about this is that it shows us how locals really live. You learn about their culture and all of that. This is how it should be. I would hate to see them all disappear but no one really has the money or resources at the moment to fix them up. You did a great job of capturing and organizing the different sections of river life. Vietnam is one of those special places where people go with certain expectations and seem to always leave with even better memories & experiences. Kerri Such a gorgeous photo essay. It transported me right to Vietnam, so photogenic, so friendly, so fun! I would have loved to take the cooking lesson with you! We were on a luxury tour, article also on my site, and it gave us an incredible view of the Mekong. We got into many small villages, some hidden family businesses that are definitely not on the tourist trail. Certainly didn’t at all feel that we didn’t get a true experience. Wow! What a solid documentation of life on the river!! I’ve loved following your journey on Instagram and these photos in this resolution on my actual computer really take my breath away. You’ve shared such a special view and area of the world. thanks so much Rob, it really was a fascinating place. All stunning photos! Just by looking at them, I think that the people in the Mekong Delta were so friendly and very accommodating, I don’t know the place honestly until I saw your post. Thank you for touring us around.